After reading The Hunger Games by Suzanne Collins, I have been a little bit of book snob. I have been searching for a fabulous book that might compare. After looking through many shelves, online library catalogs, and asking others’ opinions, I finally stumbled upon a rather interesting looking book at Barnes and Noble. I picked it up and examined the cover closely. 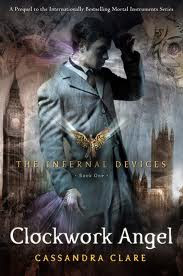 From the title, Clockwork Angel, to the interesting male character with weird markings on his hand and neck, the cover had me hooked before I even knew the plot of the book. When I got home that night, I opened the book up and was instantly immersed into a world filled with fantastical beings, enjoyable realistic characters, and a plot that kept me begging for more. Clockwork Angel by Cassandra Clare hooked me like The Hunger Games had, and I was almost instantaneously in love with the Victorian era world Cassandra had created. Not only was the world beautiful, but so were the characters. Thanks to the ingenious, rude, but somehow still appealing William Herondale and his best friend, kind-hearted James Carstairs, the main character Tessa Gray is, like the readers, in for a wild ride. I quickly finished the book and went back to Barnes and Noble, getting the second book in the series, Clockwork Prince, which I also ate up in about a week. So if you love real vampires (yes, ones that DO NOT sparkle), beautiful writing, and an engrossing story line, read Clockwork Angel by Cassandra Clare. Very nice book review, Laney. I'm one who often picks up a book because of its excellent cover art. It's a lovely bonus when the story is as good as the cover. The Host is an adult book, but I think you might like it as a follow up to the Hunger Games series.